House Republicans scrapped a plan they devised Monday night to raise the debt ceiling with an additional measure to reverse veterans' cuts. Instead, they're going clean, according to a source in the room. Leadership had wanted to extract something out of raising the debt ceiling and had settled on rolling back the $6 billion on cost of living cuts to military pensions. But Democrats have long insisted they won't give anything in return for raising the debt ceiling. The GOP plan would have relied on support from a good number of Democrats, since many conservatives will vote against raising the debt ceiling regardless of what's attached. Many House Republicans had let Speaker John Boehner, R-Ohio, know of their dissatisfaction about the earlier plan on Monday night. And House Democrats, including Democratic conference chairman Xavier Becerra of California, suggested Monday that if Boehner was depending on Democratic votes to get the measure through, he should not be so confident. Democrats have been clinging to their demand for a debt-ceiling hike to be passed without any strings attached. "I'm pretty boxed in," said freshman Rep. Richard Hudson, R-N.C. He said he wasn't likely going to vote for the debt-ceiling lift at all, but now will definitely not. "House Republican leaders told members this morning that it is clear the paid-for military COLA provision will not attract enough support," says a source from the room Tuesday morning. The speaker did make clear that the new plan would have the necessary number of Republican votes, but would have to be carried by Democrats. A clean bill will force at least a few dozen Republicans to join with Democrats in order to raise the debt ceiling, a move that could be unpopular with conservative groups and constituencies that have called for spending cuts in exchange for an increase in the nation's debt limit. Rep. Tom Cole, R-Okla., who is close with leadership, and others have often referred to these members as "sacrificial lambs." 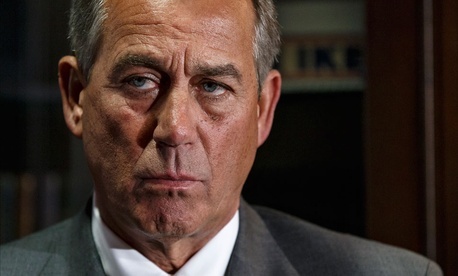 Boehner says he will vote for the clean raise. House Democrats are already sounding off on the new, clean plan. "That is what our position has always been and the speaker has been gracious in his conversations with us as to see what we would vote for and we told him we would vote for a clean [debt ceiling]," House Minority Leader Nancy Pelosi of California said as she exited the House Democratic conference meeting Tuesday morning. "We think no matter who the president is and who controls the congress, the full faith and credit of the United States is not negotiable." House Democratic leaders sent a message to their members this morning that "the debt ceiling is clean, must be clean and that's the only kind of vote that we would take," said New York Democratic Rep. Nita Lowey. Democrats have long been against voting for a debt ceiling increase with anything attached to it, and were concerned that doing so would set a dangerous precedent. "The Democrats have made it clear that they will vote for a debt ceiling that is clean and any attempt to attach any other goodies onto it is unacceptable," Lowey added. Maryland Democratic Whip Steny Hoyer expects 180 or more House Democrats to vote for the clean raise. On the Senate side, Senate Budget Chair Patty Murray, D-Wash., called the new plan "encouraging," and that she "look[s] forward to [the House GOP] sending over a debt limit bill with no ransom demands attached." Not everyone is quite as happy. The Senate Conservatives Fund blasted out a release Tuesday morning saying that "John Boehner must be replaced as Speaker of the House." The new plan, introduced Tuesday with a planned vote for Wednesday, would violate a GOP pledge to allow a three-day waiting period between a bill being introduced and a vote. There is, however, a loophole in that pledge for passing emergency legislation. House Republican aides insist they are not in violation of the three-day rule because the language was posted to Rules last night, and that they will just push forward with a portion of it. The Treasury Department has said Congress has until Feb. 27 to raise the debt limit, and Boehner has repeatedly vowed the nation will not default on its obligations. The Senate is considering a measure to roll back the military cuts this week. The move is a political win for Democrats, who now don't have to go on record against restoring veterans' cuts, or alternatively look hypocritical for violating their "clean only" pledge. But Republicans also now avoid a messy fight over the debt ceiling. In fact, many conservatives had been asking leadership to put up a clean bill for weeks, since that's how they expected the drama to play out. Looks like they're getting their wish. Matt Berman and Billy House contributed to this article.